You can choose to use the program to teach cursive or manuscript. Your student’s workbook and flashcards will reflect your choice. After completing the Foundations A program, I can honestly say I am extremely happy with it! This is THE ONE. It really is a comprehensive reading, spelling, and handwriting program. Little Miss Bella is reading, spelling, and writing (in cursive!) so very well… at age 4! She rarely gets frustrated with the program and actually enjoys sitting down for a lesson. We started Foundations A in June and completed about 4 lessons per week through early September. As many homeschool mamas may know, sometimes the hardest part of homeschooling from the get-go is helping the children to sit and focus on the activity at hand. For this reason, we invited another friend, J, to join us. He was about 9 months older, but was at about the same level of phonics exposure in the beginning. Both Bella and J had done a handful of lessons from “Teach Your Child to Read in 100 Easy Lessons,” so the concept of letter sounds had already been introduced. We were hoping that if we had both kids working together, the extra structure would help them focus. J’s mom and I took turns teaching twice a week, completing two lessons per visit. We were able to keep up at this rate until the last 3-5 lessons, at which time we decided to slow down because the lessons got a little bit more rigorous. There are sample pages of Foundations on the Logic of English website, so you can easily see the progression of the lessons. The lessons are structured very well, with a variety of writing, verbal, visual, and kinesthetic activities. The children can’t feel bored with this one. The parent instructions are clearly written and thoroughly explained. That said, the lesson activities were also easily adjusted or moved around when we needed to make changes. Each lesson begins with a list of objectives, including Common Core alignment, which is helpful for those families living in states where homeschooling is highly regulated. You will also always know exactly what you need to complete the lesson, because a list of materials is included for each lesson just under the lesson objectives. 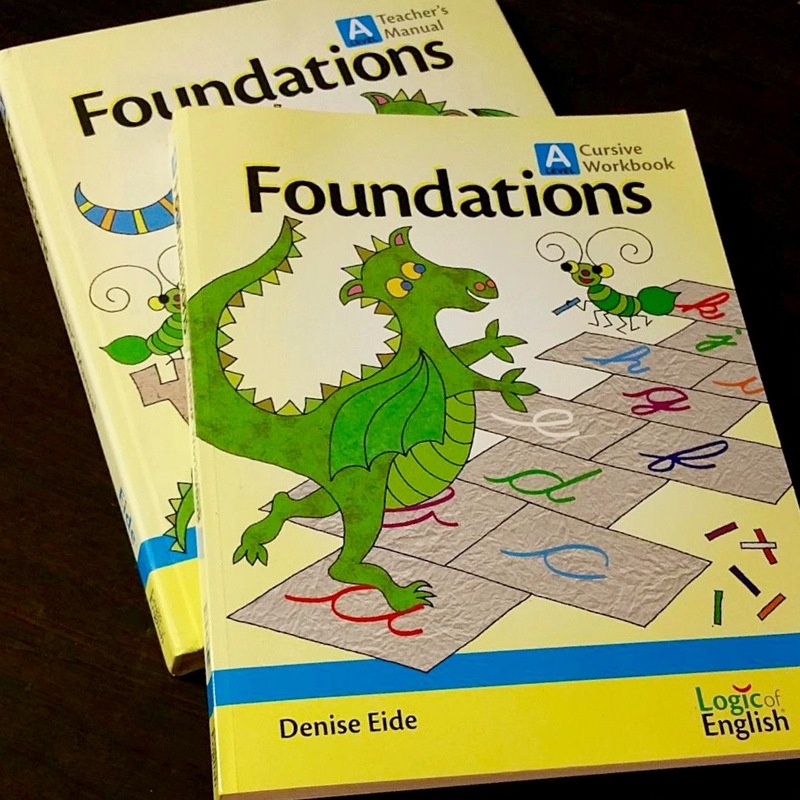 If you purchase the complete set for any level, it will include all the teaching materials you will need, but often there are suggestions for other items such as Dr. Suess books, or other household items. 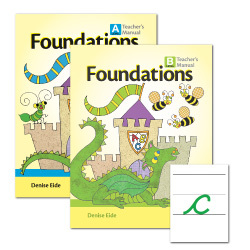 The Teacher’s Manual and Cursive (or Manuscript) Workbooks are just two of the resources provided in the Foundations A set. After the list of objectives and materials, the lesson is split into a number of sections, first just Phonemic Awareness and Handwriting. Later, more sections are included such as Phonogram Practice, Words (a short spelling list), and Reading. Phonemic Awareness: This section is just the beginning of the comprehensive nature of the program. The children learn about voiced and unvoiced sounds, what the true definition of a vowel is and how to identify one, and nasal verses non-nasal sounds. All this helps them to identify the sounds they are hearing in words which translates to better spelling. They are taught ALL the sounds each letter makes, in order from most frequently used to least, with the help of the Basic Phonogram Cards. They learn to identify which are short vowels and which are long. They learn how to combine individual sounds to create a word or a blend. The depth of this section really impresses me. But unlike most other programs, the presentation of all this “heavy” information is introduced and reinforced in such a playful way that the children really lock the knowledge in their little brains and hardly notice they are learning. Handwriting: I am in LOVE with how this handwriting program is broken down into small steps for the children. If you click “Show me sample pages” on the Logic of English website you can see what I’m describing. Each pencil motion is given a name such as: curve, swing, drop, hook, glide, etc. The children simply have to combine these motions to create letters. The set includes tactile cards so children can FEEL the strokes that make the letters before practicing with their fingers in the air, or on their leg or table top. Next, they will try the strokes on their whiteboard (also included), and finally they will practice on paper in their workbook. Using cursive has really helped Bella to write more comfortably, and she is writing in mirror image much less frequently. Some children are going to need more practice in this area, but I think it is important to note how much the lessons are asking the children to practice. I really trust this program and if they only have the children practicing the new stroke or letter 6 or 9 times, then that’s all I had Bella do. If she needed extra practice with it, I added it in on another day or time. Because Bean hates writing so much, I really wanted to avoid burning Bella out on it so early, too. That said, the one thing I wish this program offered is a laminated sheet with all the lowercase letters written out on one side and all the upper case on the other. I think tracing or copying each letter at least once a day after learning them is extremely helpful in teaching cursive. I found another cursive book that had a page as I described, so I ripped it out and laminated it for that purpose. I only wish the formation of the letters matched with LOE a little better. Just some of the additional resources included in the Foundations A and B set. 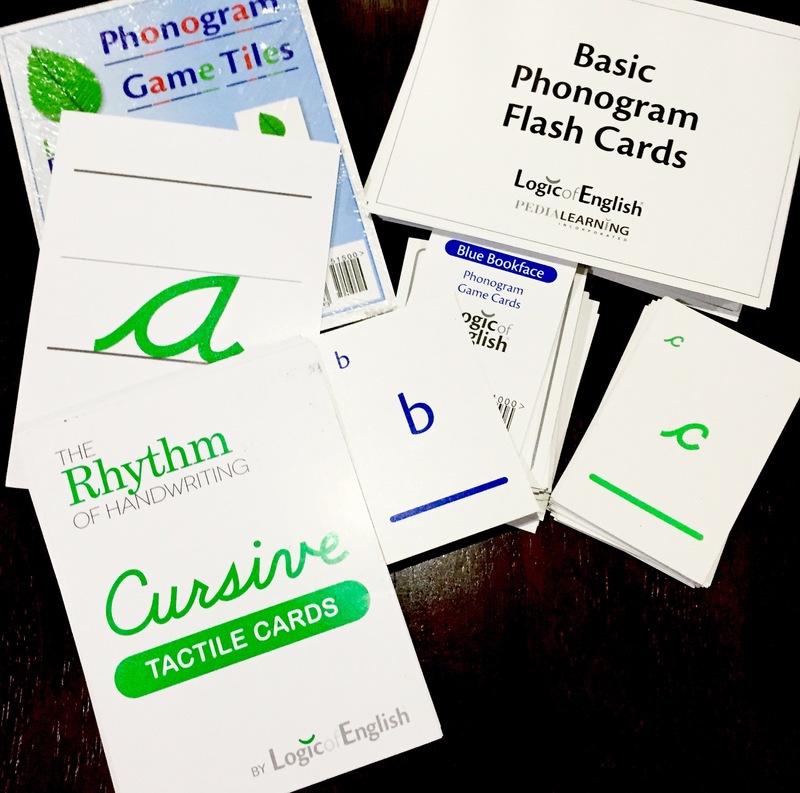 Phonogram Practice: These games and activities are often the favorite part of the lesson for the kids and serve to reinforce the phonograms the children have already learned. They might use the included game cards, a game in their workbook, or even just the basic phonogram cards mentioned earlier. Words: I was little taken aback when I saw that there were short spelling lists in the later lessons of Foundations A, but found them to be perfectly aligned and appropriate for what the children had already learned. There are three words per lesson on the spelling list, along with tips and tricks to help teach them. They also include two extra words for those kids who are need more of a challenge. These are not meant to be those drill-and-kill type spelling lists. They are meant to reinforce the concept of applying phonograms to real words. I like to think of it as spelling practice. They introduce the words and the phonograms that comprise them so that the words and the process become familiar. I love that the lessons encourage you to have the children try to write the word themselves before showing them the proper spelling. It is fascinating to see what they’ve learned come together into a whole word! After every five lessons, you will find a Review Lesson. It includes a list of skills with a level of mastery (on a scale of 1 to 3) assigned to each, that the students should have achieved before moving on to the next five lessons. We found these sections MORE than helpful. It was easy to assess if our kiddos were ready to move on or not. Any time they weren’t quite ready, we had a number of great review activities to choose from to reinforce those skills before moving on. Another facet of this awesome curriculum that both J’s mom and I appreciated, is the little side bubbles strategically placed throughout each lesson. Sometimes they included other fun activities to extend upon the lesson. While other times, they suggested more challenging activities or ideas to help students who are struggling. They also offered advice to assist students in their speech skills (which is so important with phonics-based learning!). Once we had finished Foundations A in early September, it was apparent that J was ready to move on at a pace of two to three lessons per week, while Bella needed to slow down a bit with just one lesson per week. 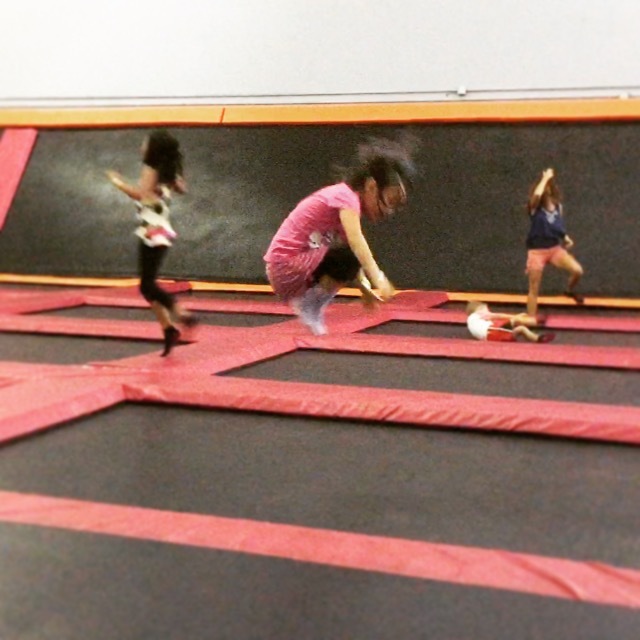 So we stopped meeting to complete lessons together, and celebrated with a trip to a trampoline park. Wahoo! We can read! Let’s celebrate! Now, J and Bella are both progressing steadily though Foundations B, each at their own pace. Both of our families are more than happy with the curriculum and are confident our children are on the right track with Logic of English. I am looking forward to ordering Essentials for Bean, to see if we can get some logic back into her decoding and spelling skills. (Update: I reviewed Essentials too!) I am so happy to have finally found the right reading curriculum for our family. If you are interested in the Logic of English program, please consider using one of my links to their website. I was blessed with the opportunity to add affiliate links here, which means your purchase of LOE could support our homeschool. Thank you!